Amanda has been added as a guest to Collectormania 22 in Milton Keynes. It takes place in November and general admission is free. Amanda’s photo op is only £25 and is available both Saturday and Sunday. Her autograph is also £25. I’ve added all the information to the left sidebar. The last surprise part of our StargateforS4K fundraiser is all the shirts you’ve seen here on the site and in person in Chicago are now available for purchase for a limited time. Since production for shirts is expensive, I’ve had to use a website. 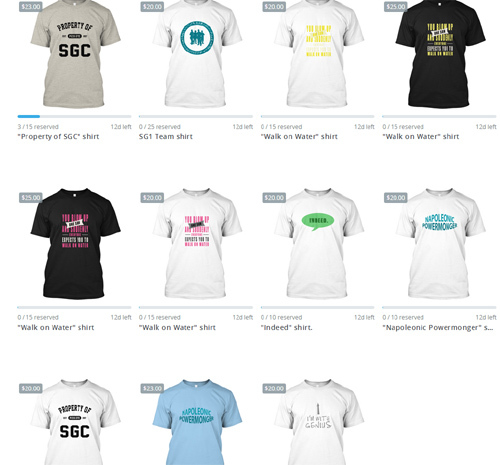 The shirts are available in various sizes, types and occasionally color. This is a tad different than what I usually do because, unfortunately, the website automatically charges a fee for production costs, but 100% of the proceeds will be going to Sanctuary for Kids. The website I chose will only make the shirts if the set minimum order has been reached. Fortunately I’m able to lower the number of shirts needed for production if I need to. Head on over to my storefront and take a look at all the shirts available. If you have any questions I’m available on twitter as AT Online, on facebook and through email. We’ve already raised $3,500CAD for Sanctuary for Kids, let’s see if we can reach $4,000CAD! The fundraiser concluded yesterday and I’m very happy to announce that over $3,500 was raised for Sanctuary for Kids. A huge thank you to everyone who took part. Earlier today Amanda posted the video of her doing the ice bucket challenge. As someone who hates cold of any kind, I have to give her major props. And Alan too for dumping it on her lol. First of all, I’d like to apologize for not having this up yesterday. My short flight home from Chicago turned into a 12 hour rerouting all over the US and I didn’t get to CA until 9pm. 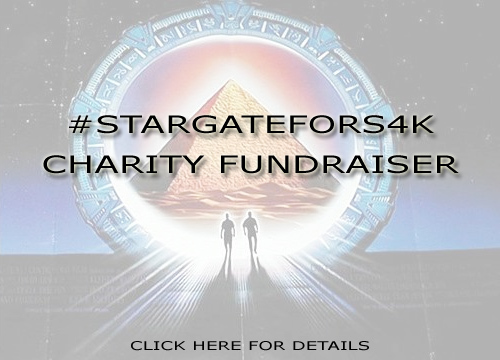 Thank you to everyone who spread the word and attended the Stargate for S4K fundraiser on Sunday. It was a huge success. A special thank you to Kim and Kenn who went above and beyond what we ever expected for promotion. Thank you! I also want to give a great big thank you to those who donated items for the fundraiser. Stacey, Merri, Harmony and to those of you that donated items during the event. I’m so sorry we were too busy to get your names but we haven’t forgotten you or your generosity, thank you. Your generosity enabled us to raise more money than we thought we could. Paula, there are no words to adequately describe how much your generosity meant to us. Your contributions were a major part of why this fundraiser was so successful. Thank you from the bottom of our hearts. And last but certainly not least, Angie. What can I say but without her, we wouldn’t have even had a fundraiser. We approached Angie almost a year ago when we set the fundraiser in motion to see if she would be willing to design a few things for us. 99% of the designs we used were all Angie. Thank you Angie, you made life just a little bit easier for us and a whole lot geekier for everyone else. As previously announced, we will not be announcing the total from the event until August 28th. We will combine that total with the virtual fundraiser total and announce a grand total on the 28th. 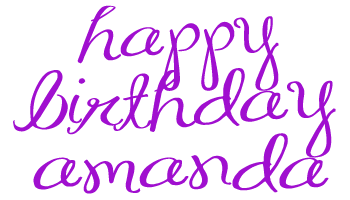 And speaking of the virtual fundraiser, that kicks off today!